Eddie Aikau had the lineage of a king, and he became a modern member of Hawaii’s royal pantheon. A descendant of Hewahewa, the kahuna nui (high priest) King Kamehameha I and his successor Kamehameha II, perhaps no other pure Polynesian surf hero has been held in such high regard since Olympian Duke Kahanamoku. The 3rd son of an esteemed family, Aikau personified the Hawaiian profile: big, bold. humble, strong, generous, respectful, gracious, fun-loving and, most of all, a master of the ocean lifestyle. As the first lifeguard at Waimea Bay, Aikau saved over 500 lives and became famous for riding big Hawaiian surf, winning several awards including the 1977 Duke Kahanamoku Invitational Surfing Championship. At 31, Aikau joined the Polynesian Voyaging Society as a crew member on the Hokule’a, a double-hulled voyaging canoe, on a 2,500-mile journey to follow the ancient route of the Polynesian migration between Hawaii and Tahiti. The Hokule’a left Oahu March 16, 1978. It was caught in huge sea storms and capsized. In an attempt to get help, Aikau paddled toward Lanai on his surfboard. Although the rest of the crew was rescued, Aikau was never found. The ensuing search for Aikau was the largest air-sea search in Hawaiian history. 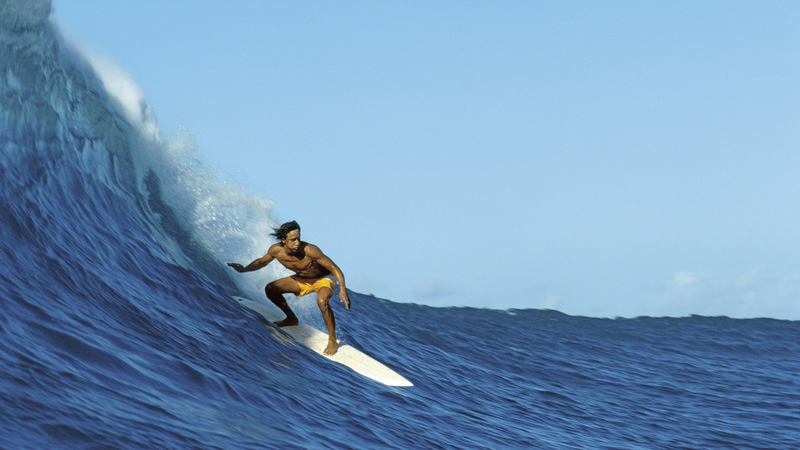 As a Waimea Bay surfer Eddie had few equals– He was the undisputed king during his tenure there. 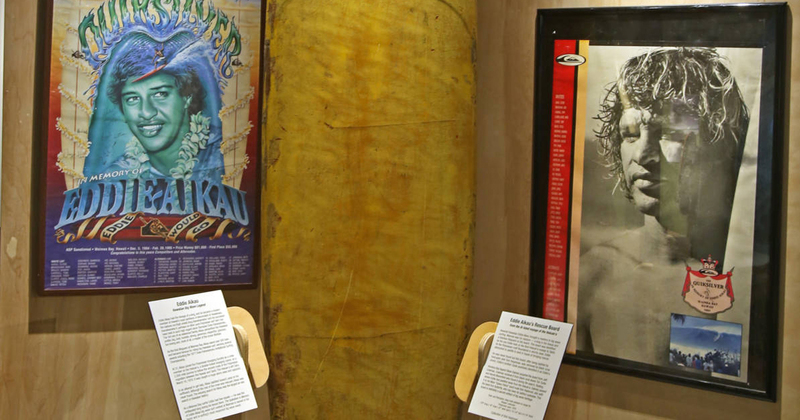 The Quiksilver in Memory of Eddie Aikau big wave surf contest at Waimea is named in his honor and is surfing’s most respected big wave event. Revered Hawaiian Eddie Aikau brought a mastery to big wave surfing. Waimea was his stadium — A king in the lineup and a fearless lifeguard on the beach. 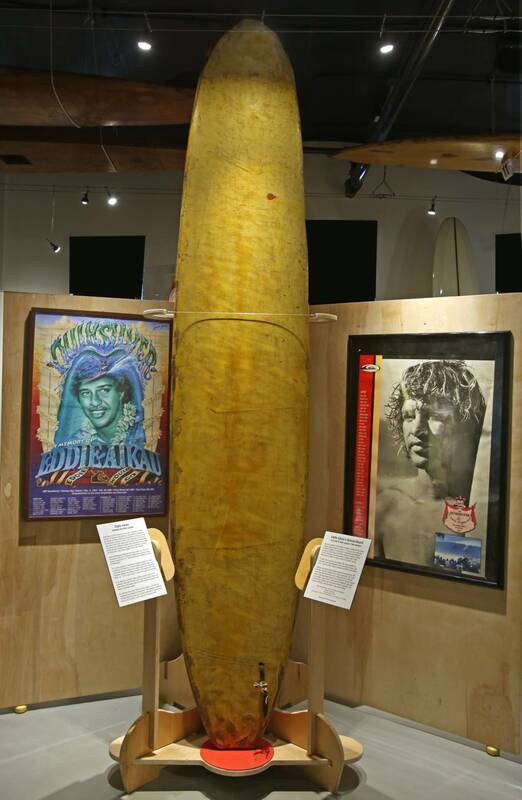 This board was identified as the one Eddie took on the third Hokule’a voyage to Tahiti. As the Polynesian craft floundered in stormy seas, Eddie attempted to paddle to land in hopes of bringing rescue. He was never found but this board, after being sighted by helicopter pilot Tom Hauptman, was retrieved by black coral divers. Eddie’s brother Clyde positively identified it as Eddie’s. Honolua Bay legend Steve Dabney acquired the board from Jeff Coleman. Coleman received it from black coral divers Tim Turtle and Harold Bloomfield who found it during the search, floating where Eddie had paddled away from the hokule’a. Dabney passed it to his Maui “Space Patrol” band mate Bob Hasbrook, also with the band Iron Butterfly, who has been its faithful custodian. This board is definitely a sacred artifact of big wave heritage.